Solomon & Kuff's Shane Smith in a contemplative moment. Photo by Gabi Porter. We are proud to introduce a new columnist to The Rum Reader, longtime society scrivener Shari Cask. She will periodically turn her prestigious pen to the august adventures of the “rum set” in New York City and beyond. — Ed. The credo of my third husband, the late Captain Palfrey, was to never turn down a chance to learn about rum and especially the people who bring it into being. When The Rum Lab brings its festival to town, it’s time for rum-loving boys and girls to clear their calendars. In September, we did just that! 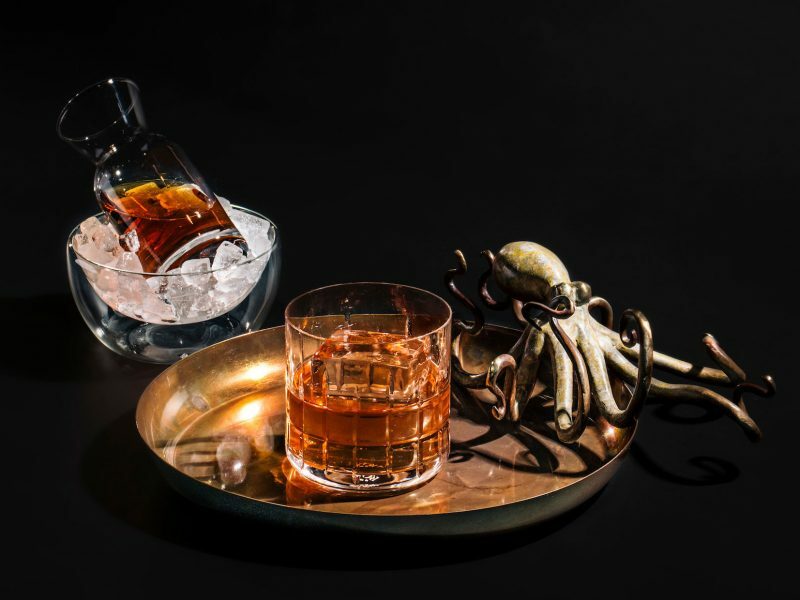 The Lab’s New York Rum Fest triumphantly returned to the seductive Varick Street boîte, S.O.B.’s, with a full day of tastings and talks featuring a who’s who of the rum world. Rum has made a rapid rise and is now in the glasses of many new admirers. To welcome them into rum society and soothe their questioning minds, the overarching concern of the Rum Fest seminars was delving into just what rum is anyway. Emmy-winning filmmaker/rum-maker Bailey Pryor explained its rich history in the clear-eyed manner of one of his films. Spirited Award-winning raconteur Ian Burrell charmed us all with his one-man Notting Hill Carnival. The curtain was pulled back on the intricacies of rum classification by La Maison and Velier’s Kate Perry, and Destilería Serrallés’ Jaiker Soto showed us the life of Puerto Rico’s beloved produce on its path from barrel to bottle. A standout presentation—due to its personal nature—came from distillery owner-operators Bridget Firtle and Karen Hoskin on their contrasting roads to becoming spirits sultanas. They captured our hearts, but we captured teeny samples of their wares. Thank you, Rum Lab. Miss you, Palfy. The Oleo Daiquiri poised at The Happiest Hour. Photo by J.N. Silva. 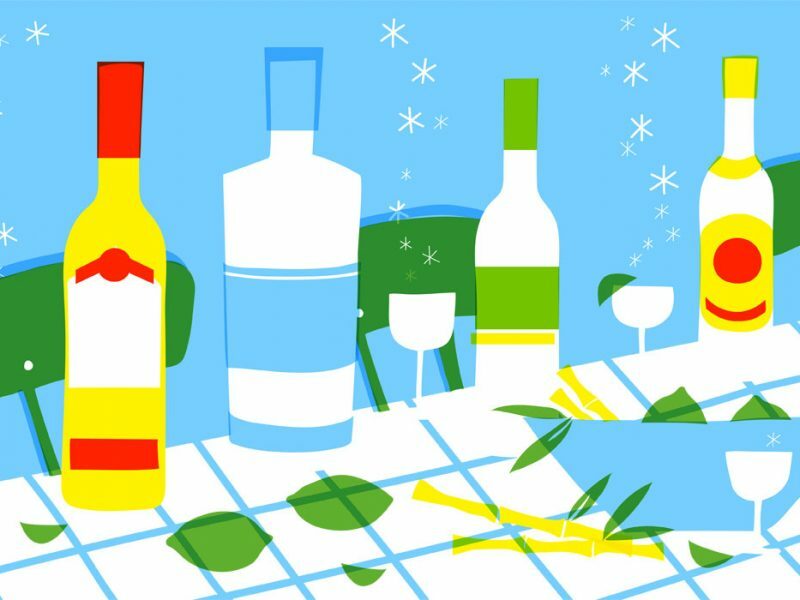 Eager as we were to explore the truth of this, a party was raised to turn Daiquiri Week into a citywide Daiquiri Crawl. And what fun we had comparing the creativity of all these bars. 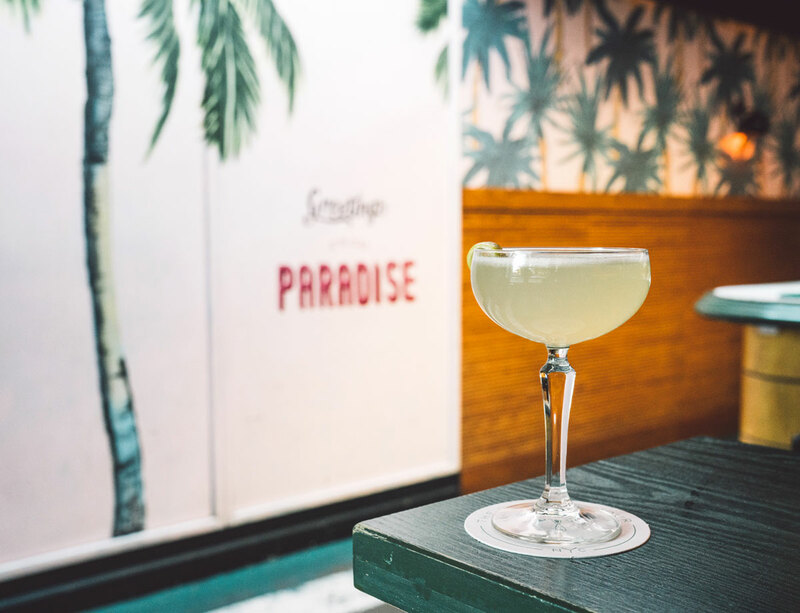 As the array of expertly made, excellent concoctions continue to be available at these venues, make sure to do your part in the ongoing cavalcade we call Daiquiri Forever. The Might Sparrow has a few words for us. Photo by Gabi Porter. 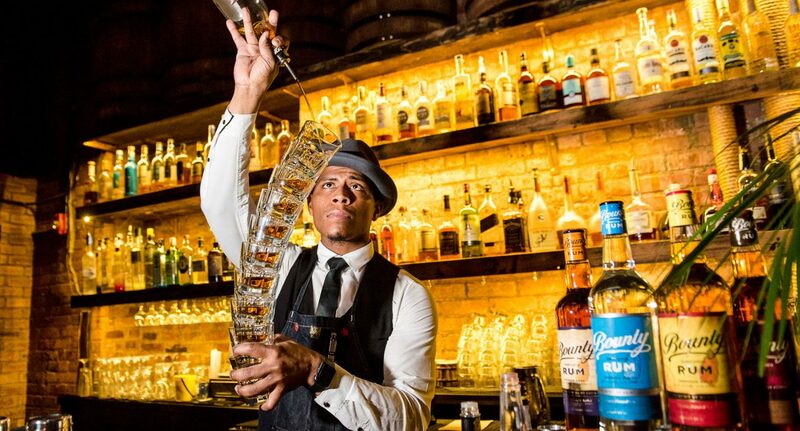 Meanwhile, the stars aligned in Harlem at the stellar Solomon & Kuff Rum Hall in a once-in-a-lifetime conflagration of rum, calypso, cuisine, and raw talent. 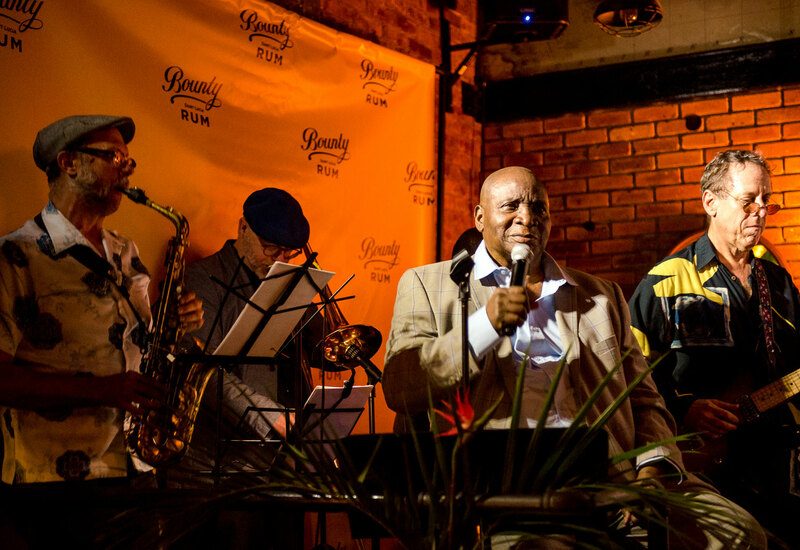 Skills of both chef and bar staff were on display at an intimate concert with cocktails hosted by Bounty Rum, but the center of attention was no less than The Mighty Sparrow himself. The original calypsonian from down Trinidad way (now a resident, like many greats before him, of Queens) treated us to his internationally-recognized vocal stylings, proving that music and rum, in the correct proportions, are vital to long life and health. Sparrow, we octogenarian bon vivants are birds of a feather. Pass the Bounty. Until next time, you can count on me to keep my ear to the ground and my glass to the brim. Cheers! Got a tip? Send it to sharicask@rumreader.com. Returning to New York City in 1963, Shari Cask spent several decades chronicling the fashionable lives of the social set in many eminent publications until Rupert Murdoch drove them out of business (especially the ones he owned). She lives in Turtle Bay with her pet parrot, Marjorie Morningsquawk.